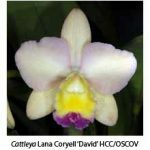 The size of cattleya flowers is influenced by the choice of parents within the sub-tribe Laeliinae, which includes (among others) the genera Cattleya, Laelia, Sophronitis and Brassavola (Rhyncholaelia). 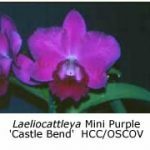 By using suitably small-flowered species as parents, it is possible to breed inter-generic cattleyas such as Sophrolaeliocattleya (Sic), Sophrocattleya (Sc. 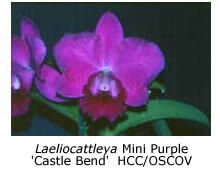 ), Laeliocattleya (Lc), Cattleytonia (Ctna. ), Potinara (Pot.) and Bishopara (Bisk), that have flowers smaller than 80 mm across; they are generally called mini cattleyas. Most, especially those bred from cool-growing sophronitis and laelias, are able to grow and flower at lower temperatures than the large-flowered exhibition-type hybrids require. Because of their small size mini cattleyas can be grown in pots smaller than 100 mm across. They flower easily, carry several inflorescences, and often have an extended flowering season. Over the years I’ve used a range of potting mixes and have found that tightly packed Sphagnum moss (either with or without polystyrene foam) is best. Tightly packed moss works well but has the disadvantage that it is hard to tell whether water has penetrated to the plant’s roots. Sphagnum moss may be dry at the top of the pot, yet quite wet at the bottom among the roots. Liquid fertilisers must be heavily diluted so as to avoid killing the moss – I prefer to use weak animal manure extract in preference to commercial preparations. Summer temperatures in my cattleya house rarely exceed 30°C, thanks to a thermostatically controlled evaporative cooler that begins to operate when the temperature reaches 27°C; it also helps to boost the humidity on hot days. Two layers of polyfilm thermally insulate this house, enabling me to maintain a minimum temperature of 8°C during winter; this layer also provides about 25% shading throughout the year. Lc. Mini Purple, a hybrid between Laelia pumila and Cattleya walkeriana, which was registered in 1965. The mauve to purple flowers are of similar size to those of L. pumila (80 mm across), whereas those of C. walkeriana sometimes reach 120 mm in diameter. Two flowers per inflorescence are common. Sic. Bright Angel has flat, red flowers with large, round petals; usually two flowers per inflorescence. Sc. Beaufort, a hybrid between a yellow-flowered cattleya (Cattleya luteola) and the red-flowered Sophronitis coccinea, usually has yellow flowers of excellent shape. Reputedly difficult to grow because of its C. luteola parent, it has never given me trouble. C. luteola has been widely used as a parent in breeding mini cattleyas. Sc. 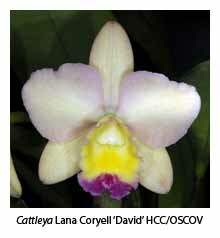 Lana Coryell, another of my favourites, is a hybrid between the yellow-flowered Sc. Beaufort and the rose/purple-flowered C. walkeriana. This hybrid usually has flowers with mauve segments and a yellow lip.